The getFromLocation(double latitude, double longitude, int maxResults) method returns an array of Addresses that are known to describe the area immediately surrounding the given latitude and longitude. The returned addresses will be localized for the locale provided to this class's constructor. 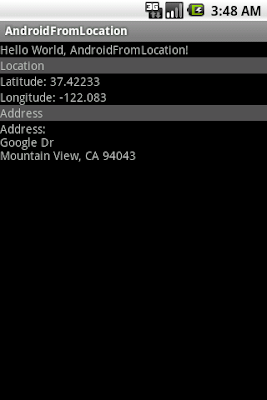 It's a exercise getting reversed address from a given location (LATITUDE and LONGITUDE), maxResults is set to one. What is the operating system you prefer.